Colin Farrell plays David. He looks like he could be an accountant; glasses, a bit overweight, squarish nerd type, and just been dumped by his wife. He and a few dozen other people check into a hotel. It’s not just any hotel, it’s a hotel where men and women are expected to find a compatible partner during their stay there. They’re deemed compatible if they both have something in common; for instance a favorite color or a favorite pastime. And homosexual couples are also part of the mix in a world in the future where society has changed, and so has its requirements. The hotel manager is played by Olivia Colman – she runs the hotel like it’s a prison. And in way it is. The rules are lengthy, complex and must be adhered to. All those detained are issued uniform clothes to wear so that no one stands out. They also must follow a rigorous schedule that includes eating meals at set times. And of course the one main rule is that the ‘guests’ must find a suitable partner among the other hotel guests by the end of their stay. It’s Limping Man who finds a partner first. She’s got a constant nosebleed (Jessica Barden – Nosebleed Woman). So in order for Nosebleed Woman to fall in love with him, Limping Man causes his nose to bleed by hitting his nose, thereby creating a characteristic trait that makes them both compatible. They get married and are ‘assigned’ a child to make their relationship stronger. Meanwhile, various animals walk around and near the hotel and at some point these animals were human beings who were not able to find a suitable partner. The Maid of the hotel (Ariane Labed) takes an intense liking to David. Their relationship turns sexual and emotional, and since she can’t leave the hotel, she helps David to escape. He escapes into the woods and is soon in the hands of the renegade Loners. They’ve dedicated their lives to everything that the Hotel isn’t. But this group has rules as well – it’s every man for himself. There is no coupling of any sort, and actually there’s very little freedom among the members of the group – with its leader (Lea Seydoux) being very dictatorial, and cruel and cold. David has run away from an authoritarian society to another. And when he falls in love with a fellow Loner member Short Sighted-Woman (Rachel Weisz), the rules that they have to adhere to make it harder for them to live the lives that they want. director and about how people feel like they always needs to be in a relationship; how other people see those who can’t make it; how you’re considered a failure if you can’t be with someone; and the lengths people go to, to be with someone. Director (and co-writer) Yorgos Lanthimos (Dogtooth), with fellow co-writer Efthimis Filippou, tells a tale of two different worlds; one where couples live, and one where singles (loners) live, it’s a parallel world, one that takes a look at how we are as a people. ‘The Lobster,’ which won the Jury Prize at this year’s Cannes Film Festival, is a highly unusual film – one with great humor, and with great sadness, and with some violence. It’s unusual and that’s what makes it unique. 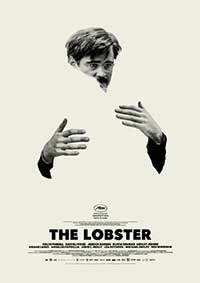 The Lobster is one of the quirkiest films you will ever see!